Do it as you go: For each year, collect items to fill 2-4 pages to create a chronological book of their years in school. Some of the things you may wish to include each year are: first-day-of-school photo, a handwriting sample, scanned awards or certificates, scanned artwork (we can do it for you), photo of them with their teachers, class photo and photos from class parties. Make a list of your children’s favorite subjects, favorite specials, friends and what they want to do when they grow up. Categorize and conquer: Search through your stash of photos and memorabilia saved through the years for items to put in each of the following categories: hairdos, friends, teachers, works of art, awards, clubs, birthdays, Halloween costumes, schools, clothes, science/other major projects and field trips. This book will be thematic rather than chronological, but still very fun for all. 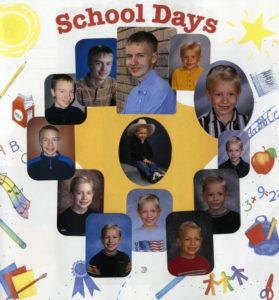 Cover page ideas: Your first page could be a grouping of school photos from each year arranged like numbers on a clock. Place the first-grade photo at 1 o’clock and follow the numbers around until the child graduates high school and put that photo at 12 o’clock. In the center of the ring of photos put an extra special photo in the center, perhaps a baby photo, kindergarten photo or a senior portrait. Another idea is to use just two photos (one from kindergarten and one from 12th grade). This idea will relieve you if you are stressing over finding a photo from every year.